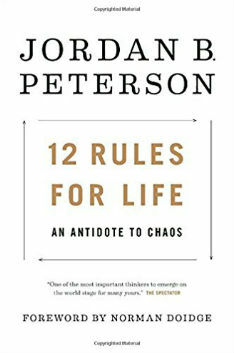 I fell down a rabbit hole of his YouTube videos and I've listened to a few episodes of his podcast and the odd interview here and there, so it only seemed logical that I should track down Jordan B. Peterson's book, 12 Rules For Life: An Antidote To Chaos and see what all the fuss is about. I'm not really sure how to quantify this book in many ways. There are elements that make it feel like a 'self-help' book (which would make this the first self-help book I've ever read), there are elements that delve deeply into evolutionary psychology and there are elements that represent a profound critique of many elements of the cultural orthodoxies of today. 4. Compare yourself to who you were yesterday not to who someone else is today. 8. Tell the truth- or, at least, don't lie. 9. Assume that the person you are listening to might know something you don't. On the face of it, a lot of these seems to be pretty self-evident, common sense kind of rules. But that's the crazy part about the world we're living in today: all of these things apparently need to be said and when they are said, they resonate with an audience that is growing in number. It's almost as if this cultural moment we're living, we're all looking for someone to sit us down and give it to us straight, like a good spoonful of medicine that might taste nasty, but will ultimately be good for us. I guess if I'm going to be so bold as to try and boil this book down to a single, overarching theme, it might be this: We're all flawed, quite probably in ways we don't want to admit, so why do we obsess about fixing the world when we can't fix ourselves? Rule 6 probably delves into this notion the most, but really, the other rules more or less branch off of this theme. Want to project confidence? Stand up straight with your shoulders back. (Rule 1). Want to learn how to value yourself so you can create a life that's meaningful? Try rules 2, 3 and 7. Want a simple and easy philosophy on how to improve yourself? Try rules, 4, 8, 9 and 10. Wanting basic advice on how to be a better parent and raise better kids? Try rules 5 and 11. Want to appreciate the good moments in life, because they can be few and far between sometimes? Try rule 12. There's a little something for everyone in this book, but all of it goes back to that core seed at the center of it all: we can't fix the world around us until we've done the hard and necessary task of looking inside ourselves to correct our own flaws. Promoting and encouraging the idea of serious self-examination is something that I can get behind. The clamor and noise around Petersen and his book, I'm not sure I can. Do I think this is an interesting and important critique of our current culture? I do. Do I think it's a PHENOMENON and LIFE CHANGING and starting a MOVEMENT of some kind? I'm not convinced. It's very worth reading and Petersen is interesting enough that I would encourage people to listen to his podcast and watch his YouTube videos to really get a sense of who he is and how he thinks. I haven't seen many criticisms of him that I found to be all that salient or effective- and a lot of the times, that goes back to his 10th rule, be precise in your speech. When you find an attack or criticism against him and go back to the original clip, you find how easily his words have been twisted into something else entirely. I don't know what Peterson represents yet. The growth of the so-called Intellectual Dark Web seems encouraging people to engage with ideas and criticisms in a much more serious way than they have ever before. I don't know what it might turn into or what's going to happen with it, but serious, deep discussions on any number of important ideas in society can only be a good thing.